Examples from the 2011 wedding of Will and Kate. Kensington Palace has announced that Meghan Markle will not have a maid of honor, declining to pick a favorite from among her friends. 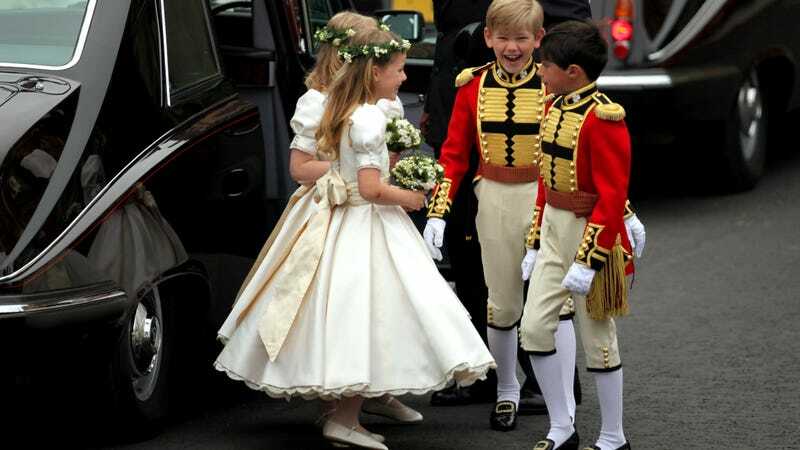 Leaves more room for her small herd of young bridesmaids and page boys, which is fantastic news for fans of hilarious bridal fashions for kids—which I assume is everyone. In other #royalwedding news, Kensington Palace has confirmed that her father is walking her down the aisle, and the couple will postpone their honeymoon in order to do an official appearance somewhere closer to home. Let’s face it, immediately after your wedding probably isn’t your single lifetime shot at getting a couple weeks off relatively easy when your grandmother is the boss. Weird That My Invite to the Royal Wedding Hasn&apos;t Arrived Yet?